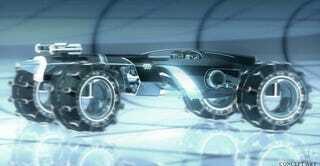 Tron Legacy is promising all sorts of upgraded digitized goodies that will make the old lightcycle look like a jalopy. Check out the first ever concept art for one of these upgraded programs: the light car! Also in this gallery is the headgear for Sam and Quorra, plus a few background images. For additional art and a few costume shots, check out Stitch Kindgom. Tron Legacy will be in theaters December 17th.